Today was the first time I have been in a movie theater to see a feature film in longer than I can remember. With the exception of attending foreign films with subtitles, I have pretty much given up on going out to see a movies for decades because I have not been able to hear them. My experience with the headphones they give you in the theaters has been less than stellar. Although the Sony FM set I have at home is pretty good, the ones I have experienced in the theaters have been of such poor quality (some are worse than others) that it almost hasn’t been worth using them at all. At this point, I think I am beyond what they can do for me anymore, anyway. I need closed captions. It means that I hardly ever get to see some of the indie and art films that seem so interesting, and I have had to wait until the big-name movies come to television so I can watch them with CC at home. Not that I was ever a big movie-goer anyway, but it has been just one more socially isolating situation, not being able to go out and be included with other people, even if I wanted to. Up until now. The technology hasn’t been available, but suddenly, in the Regal movie theater chains – and as I understand it, thanks to CEO Randy Smith Jr. , who has worked for years to find a solution – the technology has arrived in the form of closed-caption glasses. This is a very wonderful thing. An incredibly wonderful thing. I was so excited about this, that I could barely wait to attend my first movie house film again and test drive them. My friends and I chose to attend a Monday matinée. I am not sure if it was due to being hard-of-hearing (which for me is not an age-related thing – I lost my hearing when I was young), or because it was the afternoon (and only Old People go to the movies in the afternoon, right? ), or because I (we) just looked older (women who don’t color their hair probably get this a bit more), but I was automatically given the senior discount without asking. GAAAAAHHH!!!!! The Senior Discount!!!! I am not That Old! Really! Really!!!! It was sort of like being reverse-carded. While there was a minor thrill for the (very small) bit of savings, it was disconcerting to be considered a “senior”…..for the first time in my life. Especially since, I’m really not. Not yet. With conflicted emotions, I signed out the glasses and took them into the darkened theater to test drive them. The first twenty minutes prior to the featured film, there were so many previews and commercials (an incredible amount of previews. I was so surprised), that I sat there without the glasses on, since these things were not captioned anyway. 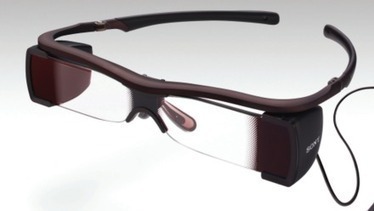 The glasses, which are adjustable, are a bit heavy, and have a wire and some kind of battery pack attached to them. Once the movie started, I finally put them on and had to find the spot on the bridge of my nose where they would be most comfortable. Once I got that together, suddenly the words appeared to float in front of me in bright green. Wow!!!! They move whenever your head moves, so I spent a good deal of time trying to figure out exactly where I wanted to see the words, and tried not to move my head too much while watching, because if you do, then the words move around the screen. I had a little fun with that, making the words flash across the actors faces, then across the top of the screen, finally settling at an angle where they would appear in the dark area below the picture. It took a while to get the hang of it, but eventually I found my position and got into the movie. It was a real thrill to finally get to go out to the movies with friends, and to at least now have the choice of being able to, after all this time. It was beyond a thrill. As a matter of fact, I almost feel tearful as I write this. Even if they thought I was a “senior” – I’ll take it. This entry was posted in Aging, Coping, Deafness, Hearing Impaired, Uncategorized, Wow! and tagged captioning glasses, hard of hearing, I'm not old, mid-life, movie captioning, Regal Cinemas, theater captioning. Bookmark the permalink. It was so much fun! AND you may become a movie-goer yet because i will be asking you to go more often! Talk about “”old people”…….you dozed off in the movie! One of my favorite activities is tending matinees during the week; it is a retirement perk I hope you get to do it more often now. I do it alone.Those first 20 minutes are completely obnoxious, so I feel free to be fashionably late for the so-called start., The pre-show is so loud I want to scream! Sometimes they seem to last so long I forget I am there to see a movie. Don’t worry about the so-called “senior” discount, it starts at age 60 in Regal theaters. Yay for technology that really works! I think a new door just opened for you! And as for the senior discount; just smile and say thanks. Double bonus.